There are a lot of fantastic ideas in the world on how to build communities. 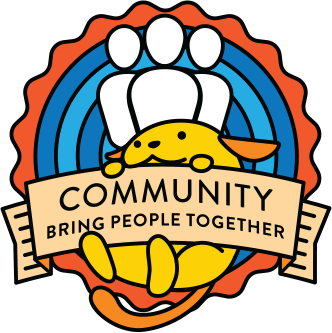 In their own ways, WordPress Meetup organizers work very hard to serve their local communities. 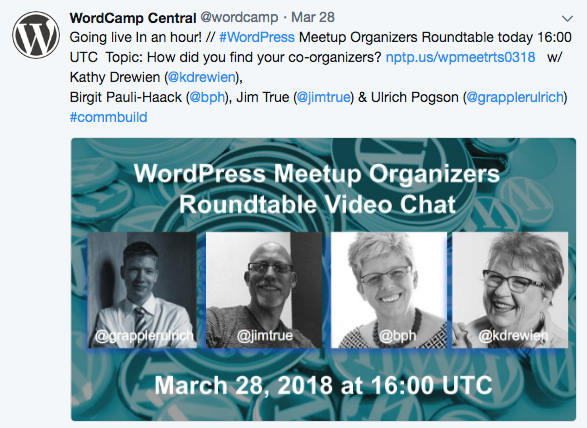 In our March WordPress Meetup Organizers Roundtable, we tried to bring some of the wisdom together. While Part I contained the survey results, this post covers my notes from hosting, conducting, and promoting the March roundtables this year. Intertwined, you’ll find extremely fragmented ideas on how these roundtables can be an ongoing activity for community Meetup organizers worldwide. It will depend on the input from other organizers sharing their wisdom to flesh this out and I hope that my rudimentary ideas trigger some inspiration in you to contribute your creative ideas. “Weekly Chats” are possible. But the time should be changed so Meetup organizers in the Asia Pacific areas can also participate. Our attendance wasn’t big, but a frequent schedule of video chats might encourage people to tune in “the next time” as the next one is only a week away. The impulse might fade if the next one were 4 weeks away. One hour can be long. For a sustainable program, shortening it to 30 or 40 minutes would probably work better. One could also do a structured form for the first 30 minutes and leave 30 minutes for open floor discussions. Survey comments from the test run signaled that the informal discussion flow was very welcoming and felt right. During the last video chat, we were able to discuss briefly the Anniversary party, including how to order swag and how to get on the map with all the parties. We could also have a series with a more structured format including news, ice breakers, and introductions. Topic and Wrap up might also be less intimidating for participants as those don’t imply the need to speak up. We received a great array of suggestions from the survey! They would probably enable us to schedule about 20 weeks out. We could also repeat popular topics for discussion. Each video chat could include different individuals who still have more to say about all of it. One topic we discussed in almost all sessions was “Organizer burn-out”. The struggle is real. Tackling leadership topics and conflict resolution should definitely be on the program. What do you think? What is are your ideas to Topics and format of these chats? For this test, we had a short call for volunteers via the P2 post, and we scheduled four hosts in each show. The format was based on three meetup organizers and a moderator, all trying to keep the discussion on topic and field the questions. But this could definitely be handled by just two co-hosts, and rotate among a group of volunteers. Also, a cross-over to WordPress TV might be possible. However, “format + topics” will also determine the hosts and guests for an event. Zoom Chats seem to have worked well. Some people were in front of their desktops with headsets and microphones, some of us where sitting on the sofa with the laptop. We also had a couple of guests using their smart phones to connect. I was a little disappointed that we weren’t able to record the show in the “Brady Bunch” view instead of just the person speaking at the moment. Maybe there is a setting for that and I missed it, or maybe I am ahead of what’s possible with current technology. Ha. Zoom also allows for people to call in by phone. We did not use this feature during our tests, but in the future, we should offer phone numbers for low-bandwidth connections in other parts of the world. A couple of organizers joined us just on audio, with no video. Community Deputies with access to the Zoom space would need to start off the show, identify ‘the host’ of this day’s show. The host then was able to control the recording. For future event coordination, it would help to know who will provide the backend support. Again, a shout-out to Andrea, Cami and Courtney for their support and for their responsiveness when we needed help. They also uploaded the shows to the WordCamp YouTube channel. For each show Zoom’s provides the video recording, a separate audio track and the chat transcripts. Due to time constraint, I was not able to do anything else with the recording. We would need additional volunteers to edit machine transcriptions for the audio, and it would really help if we also had a space to publish the video and audio as podcast, with transcript. That would enable people to hear the conversation on demand, and writes could use the transcripts to create summaries for blog posts and handbook. The test series was announced via a P2 blog post, and it was updated every week with the social media graphic and link to the recordings. It was mentioned multiple times per month in both Slack-channels and announced via Twitter via the @wordcamp twitter account. In addition, other community members retweeted and liked the announcements. To make this a sustainable activity, we would need a more purposeful marketing and content plan, with a longer lead time. Your ideas are certainly welcome. It was a great experience! Connecting informally via video chat with other organizers was already a success. Although participation wasn’t high, the organizers, who participated, expressed enthusiasm for this kind of peer-to-peer discussion and learning experience. Being a community organizer can be a lonely endeavor, and not everyone is lucky enough to have a team of co-organizers. Being able to connect face-to-face with other community organizers in a video chat is all it takes to offset the frustrations and reenergize an organizer. To keep the initiative fresh and to continue reinventing itself we should plan more video chats. And we should experiment with different formats and ideas. We should explore pathways for community members to create events and see how that goes. And finally, we need a support structure for content, production and follow-up. If you find we missed an aspect, don’t hesitate to let us know, too! If you want to volunteer and be a part of an ongoing effort, mention it in your comments as well. At Contributor Day at WordCamp Europe on June 14, we will work through your comments and create a proposal for further steps. It will be posted here afterward. In preparation for this work, we will close comments on this post on May 31, 2018. Reminder: If you can make it to Contributor Day in Belgrade, you need to register separately and I am looking forward to seeing you there! Wow, that really resonates! Since we’re all spread across the globe and in different timezones, it can sometimes feel lonely, even though we’re all building communities. It’s nice to have synchronous chats every once in a while to be reminded of the community we’re a part of. The roundtables were (and continue to be) a great idea for meetup organizers (and those who might want to become one) to connect! I am glad to hear that there is interest in continuing them. Weekly chats sound fun, but I don’t know how realistic that would be in terms of finding folks available to host/guest for an hour every week. What if there was one topic-driven roundtable with a panel of hosts/guests every other week, and the other weeks have an open-floor discussion as a follow-up on the same topic with a single host? Or even something like office hours on video? I like the idea of 30 minutes structured format and 30 minutes open floor, that’s worth trying! But I agree that a shorter duration of about 30 minutes for the entire session could be more sustainable. Shortening the duration could also make weekly chats easier to attain, make it easier for people to make the time commitment to attend, and make it easier or folks watching later to catch up on video. Thank you @courtneypk! I like the alternate week’s format, and we need to keep in mind the time zone spread. In the slack-channels, we sometimes hear, that a change in process, policy or just ‘interface’ wasn’t known to people even a few months later. We could use a section of a video chat to discuss P2 blog posts as a starting point. P2 seems to favors people who are confident writing English, even if it’s not their first language. Some organizers might be more comfortable expressing themselves in a video conversation rather than writing comments on the blog post. The video chats might allow more people to have a voice.